JA 64 is the year book of 2006. Includes more than 50 works selected from Shinkenchiku and Jutakutokushu. 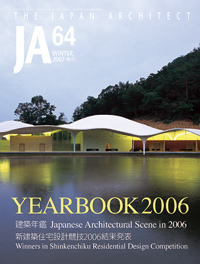 You can see the architectural movement of 2006 in Japan from this one issue.Also including Winners in Shinkenchiku Residential Design Competition 2006judge: Kengo Kuma, and Winners in the Central Glass International Architectural Design Competition 2006.